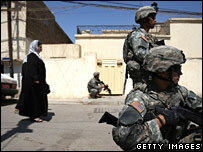 The Ministry of Defence has played down criticism of US post-war policy in Iraq by the former head of the British army. 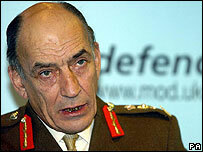 In a Daily Telegraph interview, Gen Sir Mike Jackson, chief of general staff during the 2003 invasion, attacked the policy as "intellectually bankrupt". The MoD said Sir Mike was entitled to express his opinion on his former job. But John Bolton, former US ambassador to the UN, dismissed Sir Mike's criticism as "very simplistic" and "way off the mark". Sir Mike told the Telegraph that former US Defence Secretary Donald Rumsfeld's claim that US forces "don't do nation-building" was "nonsensical". He criticised the decision to hand control of planning the administration of Iraq after the war to the Pentagon. He also described the disbanding of the Iraqi army and security forces after the overthrow of Saddam Hussein as "very short-sighted". "We should have kept the Iraqi security services in being and put them under the command of the coalition," he said. Politicians from across the spectrum have come out in support of Sir Mike's comments, made ahead of the serialisation of his autobiography in the Telegraph. Sir Malcolm Rifkind, former Conservative foreign secretary and defence secretary, told the BBC that Mr Rumsfeld was "incompetent". He said it was an "extraordinary decision" by George Bush to put the Pentagon and Mr Rumsfeld in control of political nation-building after the war. "It's like putting the British army in charge of finding a political settlement in Northern Ireland over the last couple of years," he said. However, Mr Bolton told BBC Radio 4's PM programme that Sir Mike had "read into a version of history that simply is not supported by the evidence". "And I can see where he'd have a parochial view from the military perspective. I don't think he saw some of the larger political debates. "I'm not saying that we got it right in Washington because I've made my own criticisms. His just happen to be way off the mark, very simplistic, I think in a sense limited by the role that he had." He said it was important to know whether Sir Mike had raised his concerns when he first had them. On the matter of the Pentagon taking charge of post-war rebuilding, Mr Bolton said: "I think the problem from the American perspective was there was insufficient clarity of who was in charge. "I can tell you from this side of Atlantic in the capital where things actually happened, the issue was not defence department dominance, it was confusion... he's got it wrong from where he's sat." The Telegraph also reports that in the book Sir Mike says the US approach to fighting global terrorism was "inadequate" as it focused on military power rather than diplomacy and nation-building. The US Department of Defense said: "Divergent viewpoints are a hallmark of open, democratic societies." A spokeswoman for the US State Department said she would not comment on Sir Mike's views. Sir Mike, who is now retired, also defended the record of British troops in Iraq after claims by US officials that UK forces had failed. He said primary responsibility for security would be handed to the Iraqis in the south once Iraqi authorities and the coalition were satisfied training and development was appropriate. All four provinces, except Basra, had been handed over in accordance with that strategy, he said. His comments follow a series of critical remarks from US officials about the British attitude towards Iraq. BBC defence correspondent Paul Wood said Sir Mike's comments may put further strain on the British-US operation in Iraq. Mike Gates, Labour chairman of the Foreign Affairs Select Committee, said a committee report from 2004 reached similar conclusions to those made by Sir Mike. Liberal Democrat leader Sir Menzies Campbell said Sir Mike's remarks reinforced his view that British troops should leave Iraq as soon as is practically possible. He told BBC News 24 that Sir Mike was "a man well known for speaking his mind and not afraid to ruffle American feathers".